Thank you for giving me the opportunity to discuss my qualifications for the Technology Integration Specialist Position. An abbreviated selection of my certifications, presentations, and interests can be found on this page. Following this link will bring you to a more complete curriculum vitae. Click the image to be taken on a tour of the Pan-American Highway. In Spring 2016, Sylvia McMillen, a GVHS Spanish teacher, invited me to collaborate with her on a project involving the Pan-American Highway for her Spanish 3 classes. Google Tour Builder seemed like the best tool for the job. With Google Tour Builder, we were able to incorporate images, text and video about different spots along the Pan-American Highway. We also built a companion worksheet to go along with it to help students with their Spanish literacy skills. Because of the huge success of this project, I subsequently offered a session on Google Tour Builder to interested faculty. We discussed different ways Tour Builder can be used in language arts courses, electives, social science, English and science. Counseling even decided that they could use Tour Builder and we are in the process of putting together a map of where Golden Valley High School's graduating seniors are going to college. Tour Builder is a valuable classroom resource to help bring places alive to students and incorporate geography across all disciplines. A way to increase this DOK and complexity is to have students build their own tours. ELD students can create tours of where they are from while practicing language acquisition skills. World language teachers can have students create a tour of where they would like to visit and calculate trip costs. English and Social Science students can create tours about authors and events that take place in history. Science students can explore different biomes and geological features. Writing, images and videos can be incorporated at all tour stops to have students practice their skills. This is the tour Señora McMillen and I built. This is the assignment Señora McMillen and I wrote for her Spanish 3 students. Click the image to be taken to the assignment. 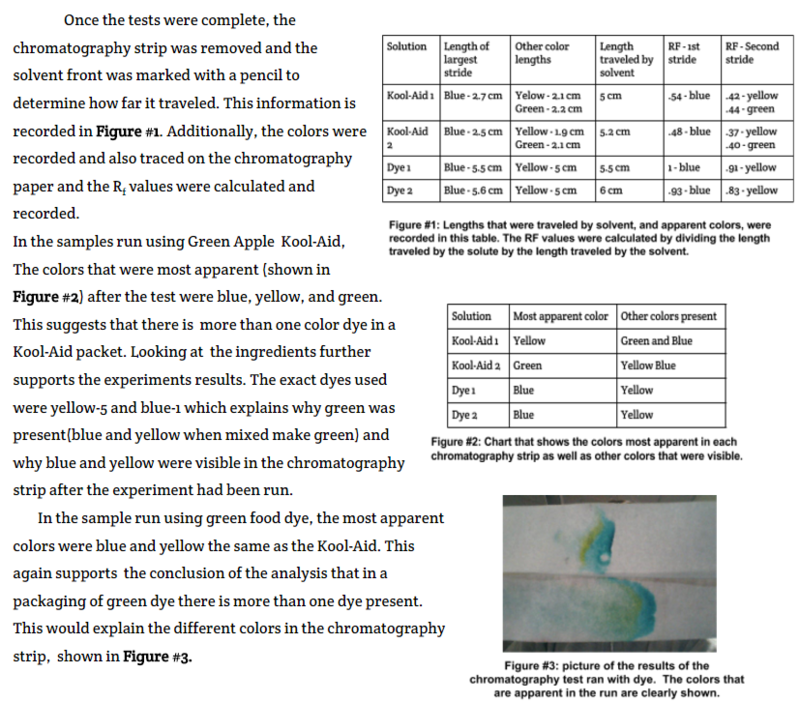 In fall 2015 AP Chemistry students undertook a quarter-long project where they analyzed the dyes that make up Kool-Aid and determined the concentration of an unknown of Kool-Aid using spectroscopy. Students worked cooperatively incorporating science, technology, mathematics, and literacy to solve a real-world problem. The assignment was scaffolded, giving various checkpoints and deadlines so that they were supported throughout the project. Students were introduced to scientific writing, which is in past-tense passive voice, which is quite different than what they learn in most of their other writing courses. Technology was used to disseminate information via web and email. On the webpage I housed all of the support and reference materials. I also gave them samples and updated the website regularly with updated check points. 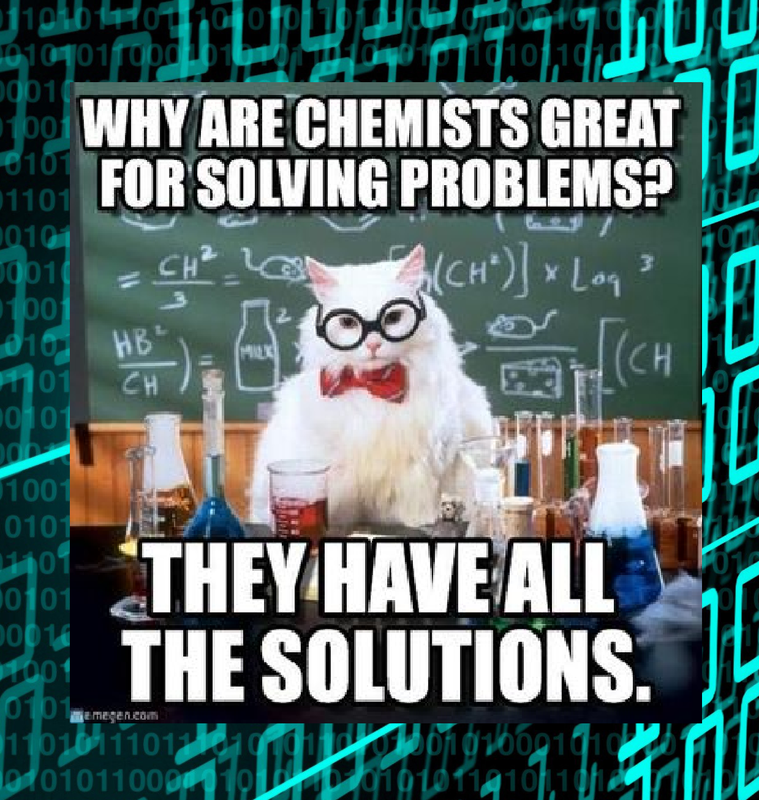 Students had to research web-resources that had been curated for them in order to better understand chromatography and spectroscopy so that they could devise their own experimental procedures. Students worked collaboratively in a single Google Doc for their group. Students also had to utilize Google Sheets in order to create their graphs and then embed them into their report documents along with any supporting tables, calculations, images. ​You are going to do a large lab project involving chromatography, spectrophotometry and Kool-Aid. First you will do a paper chromatography experiment to see the different dyes involved in a particular Kool-Aid flavor. Using the information from the chromatography experiment, you will select a range of wavelengths in order to conduct your spectroscopy experiment. You will then analyze a sample of Kool-aid in order to determine the wavelength that achieves the maximum absorbance at which you will conduct your experiment. Then, using known samples, you will create a calibration curve for the Kool-Aid at the wavelength you selected. In order to do this you will have to conduct serial dilutions. Finally, you will be given Kool-Aid of an unknown concentration and you will have to use spectrophotometry and the calibration curve to determine its concentration. The last few years I have been demonstrating Interactive Digital Activities to teachers and using them in my classroom. Lisa Highfill has coined the term "hyperdocs" and I recently shared this idea with my colleagues during a collaboration. The presentation at the left was written by Travis Harding (AHS librarian) and me. Thank you for the opportunity to showcase my work.